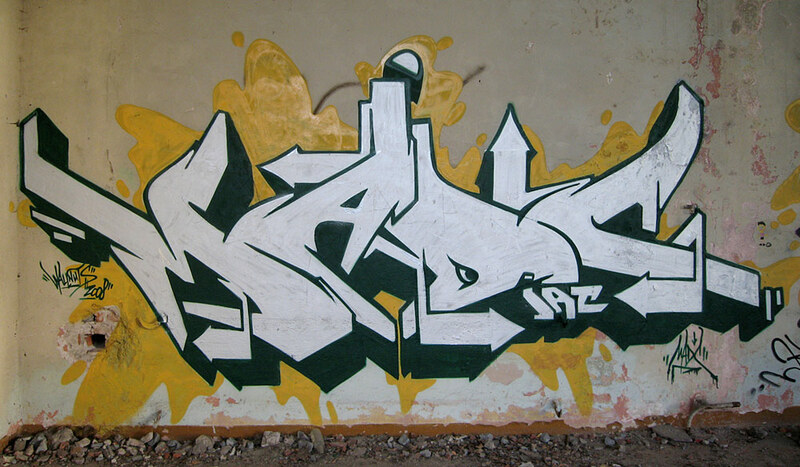 MadC is one of the most talented graffiti artists in Germany. She puts in more work and travels further and more often than most of us. She's got style and can control. 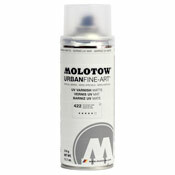 Germany has some of the world's biggest aerosol artists, and MadC is one of their up-and-coming stars. She spends five months out of the year traveling to paint. In addition, she always paints with talented writers from around the world. MadC is an artist to look out for in the years to come. MadC: I write MadC, I started in 1998. MC: I am member of the Bandits crew (Germany, France, USA, Australia) since 2001 and the Wallnuts crew (USA, Germany) since 2007. AP: Where do you call home? And how long have you lived there? MC: Hard to say as I travel constantly and do live in different countries. However, I was born in Germany and that's where my base is for sure. MC:I mostly do semi-wildstyles but my aim is to gain control over all techniques and skills provided by can, cap and surface: styles (wild, bubble, simple...), tags, character (cartoon and photo realistic), backgrounds... I love details, keep the pieces clean, think about color combinations carefully and never leave a piece unfinished. MC: I got my influences from the very few books and magazines I got hold on back in the days. I was blown away by the works of Dare, Swet, Seen, Toast and Amok. They still do influence my work. AP: The characters, backgrounds and pieces that you've done are very well thought out and executed. What type of artistic background do you have and how has that helped you with graffiti? And what were you doing before you started painting graffiti? MC: I studied design and animation and earn my living with it. Even as a child and before I started using spray cans I was painting and drawing a lot. I took a lot of life drawing classes over the last 10 years as I think it is horrible when people are proficient in a technique but haven't got the eye for proportion, which happens very often. The outline always has to be the most important bit, no matter if it is a piece or a character. MC: Very often. In 2008 it was about 5 month of travelling in the whole. MC:I was caught while painting a train once during my first 2 years as a writer. Ever since I was the faster runner. MC: That is very different from place to place. Even within the same country, sometimes the same city. In some parts of the city it is much more tolerated than in others. Mostly that's where no tourists go to. Overall they tightened the laws within Germany during the last 2 years and surveillance is more and more common. However, I haven't seen much change in the streets. The people still go out to bomb and piece. Especially Berlin is amazing. You won't see many cities in Europe with such a big vandal squad and it is still bombed like no other city. MC: My aim is to gain control over all techniques as I said before. That alone will keep me going for quite a while. Also I am a collector. I want to paint hundreds of different places and surfaces and want to try all possible color combinations and style variations. I simply don't want to stand still. I want to develop and learn as much as I can as fast as I can. Pushing my own limits is like a drug. Hence, I will probably never stop. MC: For me private property is a no-go as well as historical buildings. Everything public or abandoned places are paintable without a bad conscience. MC: Because of the internet you don't necessarily have local styles anymore. People get influenced by others living thousands of miles away. That is a pity somehow as it all starts to become one soup. On the other hand it pushed the quality regarding technique. People saw what the Maclaim crew or Daim did with spray cans and went crazy with photorealism. Also thanks to the development of spray paint just for our purpose, transparent colours and all kinds of caps, the possibilities became almost endless. Sometimes the letters are still the same as 10 years ago, but they look more professional because of fadings, shadows or the illusion of 3D. 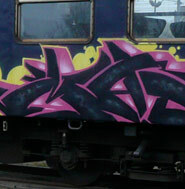 Regarding style I would say the letters got more flow over the years thanks to the influence of Dare, Swet, Smash 137, Seen's Psycho pieces or Revok, Persue and Sever. I have no idea where it is going to. But there are a lot of talented and eager young writers out there who will make sure it will go on and develop further. MC: My favorite color combination is yellow and black. It always works and burns. I also love red - best combined with white. And pink, as it always kicks. AP: The Ice Age wall that you did is very impressive. How long did that take you to complete? What made you want to do an Ice Age themed wall? MC: I can't really say as I stopped counting the hours. I never spent so much time on a wall before as it is not just very detailed but 115 foot long and 10,5 feet high. And for once I didn't want to make any compromise. Counting the days, I worked on it about 2-3 weeks I think. I love movies and paint about 2-3 movie walls each year. Peter de Sève is one of the greatest character designers and illustrators and the Ice Age movie gave me a lot of ideas how to integrate my letters in the topic (like the piece on ice). Also it was my biggest challenge yet to create so many different fur textures with cans only and without using special caps or anything. AP: Do you have any pieces that you are especially proud of? If so, what are they? MC: For now it is the Ice Age wall and its pieces. Otherwise there is always something I do and don't like about a piece. But as long as it has something new to it, I am happy with it. MC: Both. For piecing, perfection and technique are more important and fun, for bombing it is the feeling and the energy of working fast. 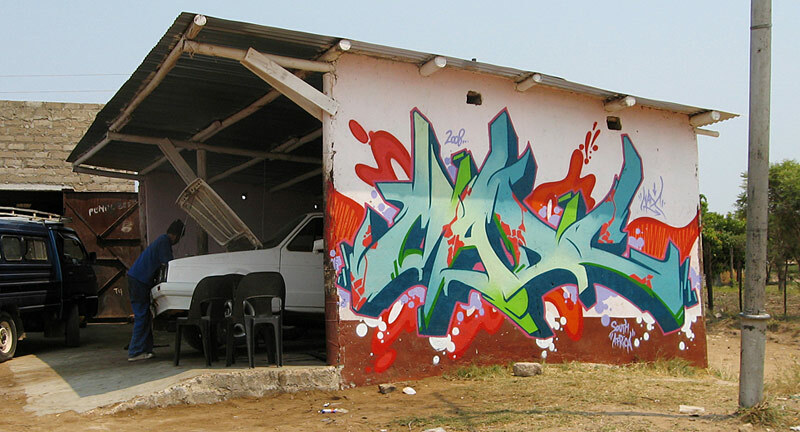 AP: How would you describe the cultural differences towards graffiti where you live versus the rest of the world? MC: In many ways graffiti is accepted as an art form in Germany. You have a lot of galleries showing writers and street artists. We provide the best paint which had a big influence on the rest of the world. Unfortunately regular German citizens are often narrow minded and influenced by tabloids when it comes to graffiti. They surely would call the police had they seen you bombing. Or even when you work on a commission. That didn't happen to me in Spain, South Africa, not even Austria. Even the British police was more relaxed. Germany simply has too many laws and regulations I guess and property is something that is valued too highly. AP: What projects are you working on? And what can we expect to see from you in the future? MC: There will be a lot to be seen in 2009. I am getting my gallery work together at the moment. I spent a lot of time in the studio. I work on concepts for some huge productions, some involve other writers, some are just my own projects. Also I am planning another trip to Africa and Asia. I want to go to more exotic countries where graffiti is hard to be found. Which countries that will be I do not know yet. AP:Do you have any last words or anything else you would like to say? MadC has tons of flicks and art available online. Be sure to check out her website Here.